Judo combines gentleness and inner strength. A subtle fusion, both harmonising with and harnessing the power of an opponent. JU - (a) Soft, gentle. This word is a word taken from Taoist philosophy and embodies the opposite of hard, extreme, unreasonable. 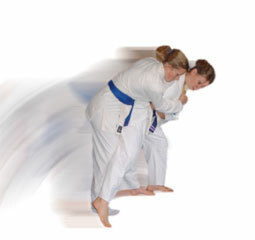 Hence the use of ju in Judo does not imply soft (as a synonym of easy), but rather reasonable, efficient. Physical action in judo is not meant to be easy (weak) so much as economic, by using the body to its best advantage and taking active advantage of any and all weaknesses the opponent may offer, so that maximum effect can be attained with maximum efficiency. DO - (a) Way, path, etc. This word was used frequently in Chinese and Japanese philosophy in the sense of the way of doing an act in the moral and ethical spheres well as the simple physical. Professor Kano 'borrowed' it from these sources. Judo is more of a sport than true Martial art. It derives from the sumo-like wrestling matches, which Samurai (Bushi) indulged in to hone their skills whilst training between battles. Seeing a system of study within the confines of Budo, Kano Sensei founded a Martial system which has grown from a noble pursuit to a world-wide community. In Japan he began his very own school which survives today. There are many throws, arm-locks, strangles, chokes and hold downs. Each with it's basis in battlefield techniques. Their application differs greatly, their being no right or wrong way, providing the student applies the basic principles to each one. the demise of the samurai (warrior) class had reduced the need for instruction. By 1883, Kano had clarified his analysis of ju-jutsu and related methods to the point at which he felt able to instruct the public through a school of his own. To that end he borrowed a small room at Eishoji temple and opened the first Kodokan for the study of Kano judo. To gain acceptance from the provinces Kodokan representatives travelled all over Japan giving lectures and demonstrations on the principles behind the new method. The finale of these lectures was a contest, with limb locks and striking excluded, between the Kodokan lecturer and a member of the local training school. A particularly important match took place in 1886 to decide which system of ju-jutsu should be approved for use in military academies, police departments and public schools. The 15 strong male Kodokan team defeated all opponents and judo became a government approved sport. The aftermath of the 2nd World War was a dark era for Japan and things Japanese. As part of Japan's war effort, instructors had been ordered to teach unarmed combat. In retaliation the occupation forces prohibited all practice of the martial arts in schools and public institutions. The ban remained in place until 1951 although there had been a gradual relaxation of the rule. Private instruction in judo was tolerated and the police were excepted from the general prohibition. The Kodokan was largely left to reestablish itself unhindered. Kano had taken a stand against the worst aspects of militarism in pre-war Japan and that, together with new draft rules which removed the vestiges of judo's martial origin made Kodokan judo acceptable to the authorities. In 1949 the occupation authorities indicated that the yudanshakai (dan grade society) of the various schools could be reconstituted as a single democratic organization. As a result the Japanese Judo Federation was formed under the presidency of Risei Kano, only son of Jigoro Kano, with headquarters at the Kodokan. Today the All Japan Judo Federation has Jigoro Kano's grandson as its President. Kenshiro Abe Sensei Founder of the IBC, BJC and Kyu Shin Do.